Megan Hill is the CEO of Professional Writing Services, LLC, a group of talented grant writers and nonprofit professionals. 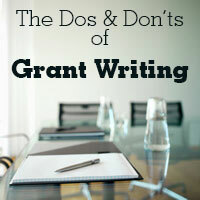 Visit the website for more grantwriting tips and how-tos at www.professionalgrantwriter.org. There’s a common misconception floating in the ether that grants are free, easy money. That’s simply not the case. Grants are awarded through an increasingly competitive system that favors only the strongest proposals. Here are some tips for making sure your proposal is in tip-top shape. Do your research on the funder you’re approaching.Make sure the request you’re submitting is appropriate for the foundation, corporation, or other grant program you’re applying under. Read the guidelines carefully and thoroughly, and research past grants to make sure your request fits both in terms of the content of the proposal and the grant amount. For example, don’t ask for a $50,000 grant from a family foundation that only gives grants between $5,000 and $15,000. Don’t wait til the last minute to start writing. Prepare your materials well in advance of the deadline, leaving yourself time to ask questions of the funder, to double and triple check your information with program officers, and to feel stress-free when you’re preparing the proposal or application. Don’t frame the proposal in terms of your organization’s needs. You don’t need money because you’re out of printer paper. You need money because you are working to solve an important, pressing, dire problem, and without money to keep the lights on and buy that printer paper, this problem will go unaddressed and people in need—not your organization—will suffer. Do use outside research to justify your project. Show that there is widespread, well documented need for the program you intend to run, and that that program draws on experts and scholarly research in determining the best course of action to meet that need. Don’t overstate or estimate your budget. Be precise with your budget numbers and don’t build in money for contingencies. Ask for only what you need, and make sure that need is justified. Don’t write that you need four reams of paper at a guesstimated $8 each. Go online, find the exact price, and quote that price. Do consider hiring an outside eye to read through your proposal before you send it in. Often people who are close to the program they’re writing about fail to see gaps in their argument and may leave out important details inadvertently. A fresh set of impartial eyes can help strengthen your proposal. Don’t mail lots of extras with your proposal. An attachment such as a DVD, annual report, or letter of support can be a good idea, but don’t overload your proposal. Let the writing stand on its own, and pay attention to the funder’s guidelines; often, funders specifically state whether they want attachments or not, and if they do, what to send. Stick to the guidelines.